Blogging is so important for your creative small business! In this post, Cinnamon Wolfe, a guest blogger is sharing 4 blogging tips to get started and get more traffic to your website! This is a guest post from a sweet friend and incredible blogger! Welcome, Cinnamon of Cinnamon Wolfe. We all know that blogging is important for our small yet growing creative businesses. We know that blogging will help us get found in Google and help potential clients learn more about us and how we can serve them best. Often where we struggle is in the how. How do we make the right choices when it comes to choosing what to blog, when to blog and what are the most important things to focus on? Well, I’ve got some help for you today! I’ve been blogging in some capacity for 7+ years and for my business for 5. Along the way, I’ve picked up some blogger hacks that can help you wade your way through the murky swamp of confusion when it comes to blogging so you can feel more confident that you are paying attention to the most important things when it comes to your own business blog! We’ve all been told that consistent blogging is king out there in content land and for a while this was really true. But the tides are shifting and pumping out daily (or even two or three) blog posts per week is really not all that effective any longer. Ultimately, Google (and your clients) are really looking for answers to their problems. And if the goal of your blog and website is to find, attract and book clients, you need to be helping them solve issues or answer questions on your blog. Lengthy blog posts with lots of quality information will serve you MUCH better in the long run than focusing on getting out multiple posts a week or even one post a week. Brainstorm and craft deep helpful blog posts and get them out once a month and you will see better and longer term results! At least one image is a non-negotiable in any blog post. That’s just the name of the game these days. HUGE, massive bonus points if that image is a branded graphic with the blog post title and your logo or website included. That image can go right on pinterest (and potentially get found in google results) to help you start driving traffic. You can create branded graphics a number of different ways. If you are proficient in Photoshop or Illustrator, you could create them there. Or Canva is a great free resource for creating all sorts of graphics. OR, if you work with a graphic designer on other brand elements for your business you could always have them design some for you. Try to make them easy to read and consistent in look and feel so they will stand out on pinterest or in search results. And if this is the first you are hearing of using branded graphics and your current blog posts don’t have them, go back and add them to every single post. Now. I promise you will thank me later! This is largely overlooked by people blogging for their business. A strong URL is kind of like a lighthouse for your blog posts. Google gives priority to URL’s to help them know and understand what your content is about. When you create your blog post in WordPress or Squarespace, the URL is defaulted to whatever title you give your blog post, but it doesn’t have to stay that way. Your title and URL can actually be a little different, and your URL should be heavily focused on a keyword or keyword phrases that indicate what your blog content is all about. Another thing that often gets overlooked by many small business bloggers is organizing their content in a way that makes it super helpful for readers to find other interesting content on their site. If your blog page includes the latest blog post in full and you have to scroll way down the page to see the next post and you don’t have obvious ways to get to more content on your site, you probably need to make some changes to make your older content easier to find. The best way to do this is to create an archive or summary page on your site that includes easy links to your older posts. There are lots of ways to go about implementing this on your site, but here is an example from my own website so you can see it in action. Alrighty! I hope you found these tips helpful and I know you are going to just rock this blogging thing! And if you need any help or ideas for blogging, I’ve got a super handy free resource for you right on my homepage…100 blogging ideas for creative business owners! Enjoy! –Thanks so much to our guest contributor, Cinnamon Wolfe! 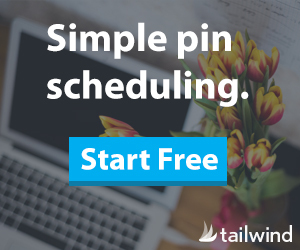 How to use Pinterest to grow your email list and audience!